In praying the Rosary we bring together three compo­nents: beads, prayers, and the mysteries. These three parts work in this way: the beads help us to remember the prayers; the prayers help us to focus on the mysteries, the mysteries help us to meditate on the life of Christ. While we do not need a physical Rosary in hand to pray the Rosary, having one is a very helpful aid to deepen meditation. “The Rosary, though clearly Marian in character, is at heart a Christocentric prayer. In the sobriety of its elements, it has all the depth of the Gospel message in its entirety, of which it can be said to be a compendium. It is an echo of the prayer of Mary, her perennial Magnificat for the work of the redemptive Incarnation which began in her virginal womb. With the Rosary, the Christian people sit at the school of Mary and are led to contemplate the beauty on the face of Christ and to experience the depths of his love. Through the Rosary the faithful receive abundant grace, as though from the very hands of the Mother of the Redeemer” — Bl. John Paul II, Rosarium Virginis Mariae, 1. Notice that the “dangling” part of the Rosary is made of a crucifix, a first “Our Father” bead, three “Hail Mary” beads (after which one should pray a “Glory Be” and “Fatima Prayer”), and the “Our Father” bead for the first decade. 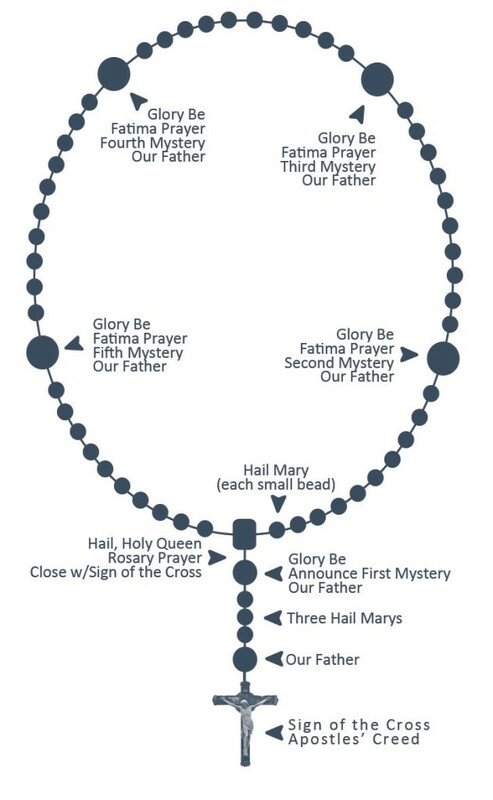 From here, go along the circle of Rosary beads, praying the “decades.” These are called decades because between the “Our Father” and the “Glory Be” are ten “Hail Mary” beads. Note: “V./” (for “Verse”) stands for the person or persons leading the Rosary, if any. At the “R./” (for “Response”), everyone else prays the response. One person may say both parts. V./ In the name of the Father, and of the Son, and of the Holy Spirit. R./ Amen. V./ I believe in God, the Father almighty, Creator of heaven and earth, and in Jesus Christ, His only Son, Our Lord, who was conceived by the Holy Spirit, born of the Virgin Mary, suffered under Pontius Pilate, was crucified, died, and was buried; He descended into hell; on the third day He rose again from the dead; He ascended into heaven, and is seated at the right hand of God the Father almighty; from there He will come to judge the living and the dead. R./ I believe in the Holy Spirit, the holy catholic Church, the communion of saints, the forgiveness of sins, the resurrection of the body, and life everlasting. Amen. V./ Our Father, who art in heaven, hallowed be Thy name; Thy kingdom come; Thy will be done on earth as it is in heaven. R./ Give us this day our daily bread; and forgive us our trespasses as we forgive those who trespass against us; and lead us not into temptation, but deliver us from evil. Amen. V./ Hail Mary, full of grace. The Lord is with thee. Blessed art thou among women, and blessed is the fruit of thy womb, Jesus. R./ Holy Mary, Mother of God, pray for us sinners, now and at the hour of our death. Amen. V./ Glory be to the Father, and to the Son, and to the Holy Spirit. R./ As it was in the beginning, is now, and ever shall be, world without end. Amen. ALL/ Oh my Jesus, forgive us our sins, save us from the fires of hell. Lead all souls to heaven, especially those who have most need of your mercy. V./ Hail, holy Queen, Mother of Mercy, … ALL/ … our life, our sweetness, and our hope. To you do we cry, poor banished children of Eve. To you do we send up our sighs, mourning and weeping in this valley of tears. Turn, then, most gracious advocate, your eyes of mercy toward us; and after this, our exile, show unto us the blessed fruit of your womb, Jesus. O clement, O loving, O sweet Virgin Mary. V./ Pray for us, O Holy Mother of God. R./ That we may be made worthy of the promises of Christ. V./ Let us pray. O God, whose only begotten Son, by His life, death, and resurrection, has purchased for us the rewards of eternal life, grant, we beseech Thee, that meditating upon these mysteries of the Most Holy Rosary of the Blessed Virgin Mary, we may imitate what they contain and obtain what they promise, through the same Christ Our Lord. R./ Amen. To pray a set of mysteries, meditate on the first mystery during the first decade, the second mystery during the second decade, and so on. For example, in praying the Joyful Mysteries, meditate on the Annunciation during the first decade. The Annunciation: Gabriel tells Mary she is full of grace, and will conceive a child by the Holy Spirit. Mary says, “Be it done to me according to your word” (cf. Lk [1:26]–38). The Visitation: Mary visits her cousin Elizabeth who conceived in old age. John the Baptist, Elizabeth’s unborn son, leaps in her womb, and Elizabeth proclaims Mary blessed. Mary issues her Magnificat, and “proclaims the greatness of the Lord” (cf. Lk [1:36], 39–56). The Nativity: Jesus is born to Mary in a stable after there was no room at the inn. She wraps the Christ-child in swaddling clothes and lays Him in a manger. “Glory to God,” sing the angels, sharing the news with the shepherds (cf. Lk 2:1–20). The Presentation: Obeying the Law of Moses, Jesus is circumcised. Simeon, who would not see death until he had seen the Messiah, is satisfied at the sight of Jesus. He tells Mary a sword shall pierce her soul, for the Christ-child is “destined to be the downfall and rise of many in Israel, a sign that will be opposed” (cf. Lk [2:21]–39). The Finding of the Child Jesus in the Temple: Jesus, brought to Jerusalem for the Passover, stays with the teachers in the temple, amazing them with His answers. When Mary His mother and Joseph His foster father return to look for Him, they find Him after three days. Jesus tells them that He must be about His Father’s business, and then returns home, subject to Mary and Joseph (cf. Lk [2:41]–52). The Baptism of Jesus: John the Baptist baptizes Jesus, after prophesying the coming of the Christ. When John gives the baptism, the Holy Spirit comes in the form of a dove and the Father proclaims from heaven that He is well pleased with Jesus, His Son (cf. Mt [3:13]–17). The Wedding Feast at Cana: Jesus, His mother, and His disciples, are invited to a wedding, where the wine is about to run out. Mary asks Jesus to intervene and, in His first public miracle, He turns the water in six large stone jars into wine (cf. Jn 2:1–11). The Proclamation of the Kingdom: Jesus calls sinners to repent in order to enter the kingdom of heaven. He illustrates the kingdom of heaven: blessed are the poor in spirit, those who hunger for justice, and those who suffer perse­cution for justice’s sake (cf. Mt [4:17]; 5:3–12). The Transfiguration: While Jesus prays on a mountaintop, Peter, James, and John witness Him becoming as dazzling as the sun, and His clothes as radiant as light. Moses and Elijah appear with Him, talking about the coming Passion of Christ (cf. Mt 17:1–8). The Institution of the Eucharist: Jesus commands us to take and eat, for the Eucharist is His Body. Whoever eats His flesh and drinks His blood in the Holy Eucharist remains in Christ and Christ remains in him. Whoever does not eat His flesh and drink His blood has no life in Him (cf. Mt [26:26]–28; Jn [6:27]–35, 47–58). The Scourging at the Pillar: Jesus is falsely accused by the high priests. Pilate finds no fault in Him but, wishing to appease the high priests, sends Him to be publicly whipped (cf. Jn [18:38]–19:1). The Crowning with Thorns: Jesus claims a kingdom not of this world and the soldiers mock Him. In mockery of a scepter, they give Him a reed; in mockery of a crown, they give Him a crown of thorns, driving them into His scalp (cf. Jn [18:33]–37; Mk 15:2, 16–20). The Carrying of the Cross: Jesus, condemned to death, carries the cross all the way to the Place of Skulls. “Weep not for Me, but for yourselves and your children” (cf. Lk [23:20]–32). The Crucifixion: Christ receives five wounds. He has one for each hand, one for each foot, and another, after He dies, where the centurion pierces His side. The earth trembles, rocks split, and the temple veil is torn in two (cf. Mt [27:33]–54; Jn [20:24]–29). The Resurrection: Jesus, having descended into hell to free the righteous, rises on the third day. He appears to Mary Magdalene, Peter, two disciples on the way to Emmaus, and, eventually, to about 500 others (cf. Lk [24:13]–48; Jn [20:10]–20; 1 Cor 15:3–8; 1 Pet [3:18]–20). The Ascension: Jesus, after 40 days with the disciples, ascends into heaven. His last command before ascending is that His apostles preach the Good News. His disciples leave, returning with great joy to Jerusalem (cf. 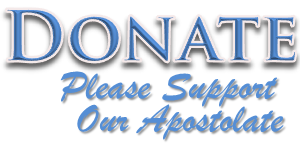 Mt [28:19]–20; Lk [24:50]–52; Acts 1:1–11). The Descent of the Holy Spirit at Pentecost: Mary and the disciples gather in the one place, praying. A sound like a mighty wind is heard, and the Holy Spirit, in a form like tongues of fire, descends on them. Multitudes hear the Gospel being preached in their own language. Three thousand are baptized that day (cf. Acts [1:12]–14; 2:1–42). The Assumption: Jesus, seeing that it is fitting that His mother not undergo the physi­cal corruption of sinners, brings His mother toward Himself as she leaves this world, bodily assuming her into heaven (cf. Rev [11:19]–12:1). The Coronation: Jesus, seeing that it is fitting that His mother be crowned as an image of His Church, places on her a crown of twelve stars (cf. Rev 12:1–5). There she reigns for all time as the Queen of Heaven, for it is through her that God brought us our Savior, and thus our redemption. Even now, she pleads for us before God Almighty. When all three parts of the Rosary come together, the effect is one of the mightiest prayers of the Church. “The Church has always attributed particular efficacy to this prayer, entrusting to the Rosary, to its choral recitation and to its constant practice, the most difficult problems. At times when Christianity itself seemed under threat, its deliverance was attributed to the power of this prayer” — Bl. John Paul II, Rosarium Virginis Mariae, 39. Bl. John Paul II, Rosarium Virginis Mariae.